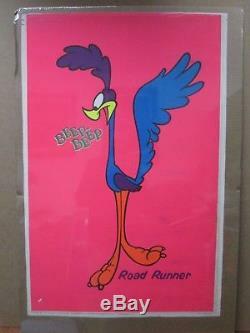 Vintage poster Black Light Poster Beep Beep Road Runner 70's. Measures 21 1/2" x32 3/4" Own a piece of vintage history from this bygone era. Highly collectible due to age. It has been stored for 40+ years, so there are normal wear and tear from warehousing and storage, age creases, folds and bends. Please inspect the ACTUAL photos carefully before purchasing. We are VintagePosterWorld, one of the largest collections of 60s, 70s & 80s posters in the United States. Please check back to our store often as we will be listing more and more of the 100,000+ piece collection! The item "Vintage poster Black Light Poster Beep Beep Road Runner 1970's In#G670" is in sale since Wednesday, February 21, 2018. This item is in the category "Art\Art Posters".